The Steering Committee is the principal decision making body for the Lake Michigan Stakeholders. The structure of the steering committee is designed to provide representation across the various types of organizations within our membership. Members serve two year terms. For more detailed information please refer to our Bylaws. Deidre Peroff serves as a Social Science Outreach Specialist with University of Wisconsin-Sea Grant and as adjunct faculty at University of Wisconsin-Milwaukee’s School of Freshwater Sciences in Milwaukee, Wisconsin. In January 2016 she moved to Milwaukee from Raleigh, NC where she received her Ph.D. in Parks, Recreation, and Tourism Management at North Carolina State University. Before that, she received her M.S. in Geography at Western Washington University in Bellingham, WA and taught at Huxley College of the Environment for two years. Additionally, she has worked as a social scientist at North Carolina Wildlife Resources Commission, Harvard University’s Program on Conservation Innovation, and has taught outdoor environmental education for many years. Her career focus has centered around conservation of natural resources and equitable development. Specifically, her dissertation work assessed the capacity for agritourism to improve livelihoods and influence stewardship among rural farmers in North Carolina and Guatemala. After growing up in Kansas City and receiving her B.S. in Geography at UW-Madison, she is excited to return to the Midwest and work on impactful research as part of Sea Grant. In this position, she hopes to use social science methods and theory to improve access to water resources among underserved communities, to facilitate environmental and place-based education, and to support the well-being and resiliency of Great Lakes coastal communities. Todd Brennan serves as a liaison to the Great Lakes community and voice for the Alliance for the Great Lakes in Wisconsin. He is currently working in the Lower Fox River Basin to support partners’ efforts in adaptive watershed-based management. Todd brings together constituents to prioritize issues important to the community and the health of the Great Lakes at a watershed level, activating stakeholders in participatory planning, policy, and education. He also advises efforts in our Western Lake Erie nutrient reduction campaign. Todd has worked on policy successes such as the Great Lakes Compact while also spearheading educational efforts such as the first Lake Michigan and Lake Erie Student Summits as well as acting as lead of Adopt-a-Beach™ for Wisconsin. He is on the UW-Milwaukee Alumni Board of Trustees, the executive board for the Root-Pike Watershed Initiative Network, and volunteers his time with his local school district. In his former life, he captained 100-ton vessels both on the Great Lakes and oceans. Tom Mlada has proudly served as co-Chair of the Lake Michigan Stakeholders since 2016. 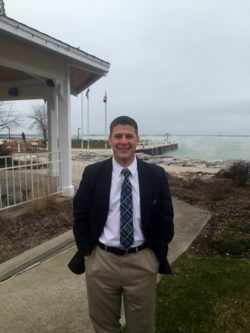 His participation with Lake Michigan Stakeholders spans much of the length of his six-year tenure as Mayor of the City of Port Washington, and includes his 2016 recognition as a “Champion of Conservation” for his work on land use protection and habitat restoration. As Mayor of Port Washington from 2012-2018, Tom championed the cause of environmental stewardship and sustainability, launching the City’s Environmental Planning Committee at the outset of his first term to lead forward the efforts. He played a vital role in securing a $1 million federal appropriation for repair of the federally-owned breakwaters protecting the City harbor, and then worked to obtain matching dollars totaling over $3 million to help fund additional stabilization and improvement work. Additionally, Tom passionately embraced the opportunity to serve as a primary representative for the City in its efforts to work with regional partners and on behalf of the State of Wisconsin to attain a National Marine Sanctuary designation for a defined area of Lake Michigan stretching from Port Washington to Two Rivers. More recently, Tom joined the Ozaukee Washington Land Trust Team, commencing his service in February 2018. At that time, he was in the final months of his second term as Mayor of the City of Port Washington. It was during these six years in public office that Tom worked very closely with OWLT leadership and staff, helping to advance work on several notable collaborative land and water resource protection projects, including the “Cedar Vineyard” lakefront development involving a partnership among the developer, City of Port Washington, Ozaukee County, and the Land Trust. With OWLT, Tom excitedly looks forward to contributing to the organization’s extraordinary open space protection and natural resource preservation work. He will be actively involved with fund development, marketing, and communication activities and hopes to serve as a very positive public representative in ongoing friend, stakeholder, and investor engagement and celebration endeavors. The Mlada family – Tom; wife Kathy; daughters Olivia (16), Evelyn (11) and Aubrey (7); and dogs Jack (5) and Bruno (1) – now call the Village of Grafton home, after previously residing in the City of Port Washington for 19 years. Tom and Kathy are both proud possessors of Bachelor of Arts degrees from St. Norbert College in DePere, Wisconsin. NRCS offers technical and financial assistance to farmers and rural landowners to help them install conservation practices. Prior to coming to Oshkosh, Merrie worked in Ozaukee, Sheboygan, Manitowoc and Calumet Counties, as well as with the Department of Natural Resources at Horicon Marsh. She received a Bachelor’s of Science, majoring in Biological Aspects of Conservation from UW-Milwaukee. Merrie lives with her husband, two teenagers, and a rescued dog and cat in Neenah. Linda Reid is the Director of Business Development for Stormwater Solutions Engineering, a boutique civil engineering design firm specializing in managing the treatment, storage and safe passage of rainwater within our communities. The firm’s mission is to provide stewardship of our lakes and streams through sustainable engineering and design. Formerly the Executive Director of Southeastern Wisconsin Watersheds Trust (Sweet Water) and the Director of the University of Wisconsin-Whitewater’s Institute for Water Business, Linda has effectively merged her lifelong love of Lake Michigan and Southeastern Wisconsin’s inland rivers and streams with her professional life. She earned her Juris Doctor degree from the University of Arkansas School of Law and has previously worked in the private sector as a staff attorney, in various state and federal government positions, and in academia as a tenured associate professor teaching business and water law courses. Linda has worked collaboratively with industry, government and academic organizations in the freshwater space for the past 15 years, focusing mainly on legal and policy issues as well as helping water technology companies bring their products and services to market. Linda has an adult son, Cale, who lives in California, and a Whippet named Tadhg who lives with her in Milwaukee. She enjoys kayaking, beachcombing, riding her motorcycle, and traveling to Ireland. Betsy is a Biologist for the U.S. Fish & Wildlife Service in the Green Bay Field Office. One of her primary duties is serving as the Trustee Council Coordinator for the Fox River NRDA. Betsy also works on Great Lakes restoration projects, AOC (Area of Concern) restoration efforts, and lends her expertise to other NRDA cases around the state. Prior to coming to The Service, Betsy worked for the Oneida Tribe, National Park Service, and in private consulting. She received a master’s degree in Ecosystem Restoration & Management from UW-Stevens Point and a bachelor’s degree from UW-Platteville. Betsy lives with her two young children, husband, and dog just a few miles inland from Lake Michigan in Mishicot, Wisconsin. They enjoy getting outside to camp, hike, and bike throughout the many beautiful regions of the state when they’re not cheering on the Packers or Brewers. Jon Gumtow is a Senior Wetland Scientist with Stantec, an environmental consulting firm. Jon manages seven natural resource staff for Stantec’s Fox Valley office. He was raised in Sheboygan County and graduated from UW-Stevens Point’s natural resource program. Jon was appointed to the State Examining Board of Professional Soil Scientists in 2002 and is involved with numerous volunteer initiatives. He is a State-licensed Soil Scientist and a certified Professional Wetland Scientist. Over the last 25 years, he has completed natural resource assessments and permitting on a variety of projects throughout the Midwest and has designed more than 25 wetland and stream restoration sites throughout Wisconsin. Jon has been actively involved with the Sheboygan River Basin Partnership (SRBP) since 2000, and has lead many SRBP initiatives including the AOC and Willow Creek projects. Jon has served on the SRBP Board of Directors since 2007 and was appointed the SRBP Secretary. He has been actively involved with several Wisconsin-based watershed initiatives and has lead many volunteer activities to educate the public and stakeholders about watershed improvements. An ecologist with training and experience in restoration ecology, agroecology, and ecosystem management, Dr. James Kettler received a PhD in ecology from the University of Georgia and a BS in Wildlife Ecology from the University of Wisconsin-Madison. From 1985-1995, he worked at the interface of land management issues examining potential improvements of traditional agricultural systems and restoration of degraded pastures in Costa Rica, working with traditional farmers on inland fisheries development in Liberia, West Africa, serving as an ecologist for the Nooksack Indian Tribe in western Washington State, and conducting training workshops on sustainable agriculture for agricultural extension agents in the state of Georgia. James also taught at the Graduate School of Environmental Studies at Bard College and the Huxley School of Environmental Studies at Western Washington University. He was involved with the International Honors Program for over 12 years, as Traveling Faculty, as Academic Director, and until January 2008 as Executive Director. Since August 2006, he has been the Executive Director of the Lakeshore Natural Resource Partnership (LNRP), a local community-based organization whose mission is to “cultivate environmental stewardship in the Lakeshore region” of Wisconsin. Chris Litzau serves as the President of the Great Lakes Community Conservation Corps (Great Lakes CCC), a regional job training and education program for disadvantaged individuals in southeastern Wisconsin. He hales from the workforce development sector where he is a tireless advocate for preparing young adults from under-resourced communities with national, portable credentials and skills necessary to achieve careers in emerging technologies. He has a strong interest in transitioning job training participants into the water sector. As the former Executive Director for 12 years at the Milwaukee Community Service Corps–an urban youth corps program that engages young adults aged 18 to 23 in community service and public infrastructure development projects—he assembled a team that included the U.S. EPA, Wisconsin DNR and CH2M HILL to pioneer the “Milwaukee Model” as an initiative to place brownfield job training participants in marine environments to assist in the clean-up of contaminated sediments from the Great Lakes and its tributaries. The Milwaukee Model is an intersection of environmental restoration, workforce development and urban regeneration. In conjunction with the City of Milwaukee, he was instrumental in the installation of several phytoremediation projects by crews of Corps members for contaminated groundwater, soil and sediment remediation. He initiated the production of nearly 15,000 rain barrels by the Milwaukee Community Service Corps, the installation of dozens of rain gardens, green roofs and other green infrastructure mechanisms, and created the curriculum for a clean energy and solar training program for disadvantaged young adults that resulted in the recent award of the U.S. Department of Labor’s Green Jobs Innovation Fund to the City of Milwaukee through a partnership with Jobs For the Future. He is also the publisher of BlueGreen Magazine—an effort to promote the ecological image of greater Milwaukee. Angela Kowalzek-Adrians is the senior Natural Resources Planner for the Bay-Lake Regional Planning Commission, an agency that has been providing technical assistance to county, municipal, and tribal governments in northeast Wisconsin since 1972. She is responsible for management of the environmental and hazard mitigation programs at the Bay-Lake Regional Planning Commission. For the past 15 years, Angela has worked with local governments, and state and federal agencies to promote sustainable planning, smart growth initiatives, and protection and restoration of Lake Michigan coastal resources. Angela holds a Master’s of Science degree in Environmental Science and Policy with an emphasis in Environmental Planning from the University of Wisconsin – Green Bay. Angela is from Livingston, Montana, but has been a Wisconsin resident for 20 years. She currently lives in Green Bay with her wife and daughter. They enjoy running, hiking, biking, camping, geocaching, and traveling. Michael Reed, Director at the Bay Beach Wildlife Sanctuary graduated from St. Norbert College and Western Michigan University. He worked at the Field Museum of Natural History, Chicago before coming to Wildlife Sanctuary. He has done fieldwork throughout the U.S.A and in Belize. He started his career at the Wildlife Sanctuary as an animal keeper and progressed to curator and then director. In the curator role he was in charge of animal care and maintenance of exhibits for the 200 plus captive animals at the Wildlife Sanctuary. He also supervised the care for over 4000 animals admitted annually for wildlife rehabilitation. Since becoming director, he has collaborated with UWGB and the Green Bay Area School District to start the first publicly funded, nature-based, 4 year old kindergarten in Wisconsin. Mike has been involved with conservation issues and projects throughout Northeastern Wisconsin. He served as a group expert for the first 10 years of the UWGB-Nicolet Forest Bird Survey. He has done Owl, Grassland bird, Chimney Swift, Breeding Bird Atlas, Crane and Christmas Bird Count field surveys. He was a founding member of the Timber Wolf Alliance and is the current president of NEW Audubon. Mike also serves as a board member on the Bird City Wisconsin steering committee. Gail and Mike have been married for 35 years and have 3 children who have all spent many hours volunteering at the Wildlife Sanctuary. Andrew Struck is the Director of the Planning and Parks Department for Ozaukee County, Wisconsin, with more than 20 years of experience in the planning, parks, habitat restoration and environmental fields. Throughout his career, he has worked on large scale natural resource planning, protection, restoration and management issues. He specializes in natural resource planning and management, regional planning, environmental policy and planning, natural resource and environmental education, and park design and implementation. Andrew has an M.S. in Applied Ecology/Regional Planning from Indiana University – Bloomington and a B.S. in Molecular Biology from the University of Wisconsin–Madison. Nicole serves as the Director of Conservation for the Green Bay Watershed. She leads Conservancy staff and a partner team in an innovative project focused on the rehabilitation of streams and wetlands in lower Green Bay. Nicole also works to integrate successful conservation strategies into the greater Green Bay watershed, and across the Great Lakes Basin. Nicole has a Bachelor of Science in Zoology and Conservation from the University of Wisconsin-Madison. She joined the Conservancy in September 1998, working on land management, land protection and grant opportunities. Nicole also served as the Project Manager on the Sheboygan Wetlands Assessment and Prioritization Project and helped develop the Green Bay Watershed Conservation Action Plan. She is the proud mom of two boys. Nicole also loves cooking with her husband and having homemade ice cream for dessert. Todd has been involved in several projects related to the Lake Michigan Watershed Academy, Wisconsin’s Department of Natural Resources Aquatic Invasive Species Program, municipal storm water technical assistance, post-disaster community recovery through economic stability, and community development related to Area-wide Water Quality Management through Sewer Service Area planning. Todd has a Bachelors of Science in Professional Geography from the UW-Oshkosh. Keith West has been a member of the faculty at University of Wisconsin-Marinette since 2002. Prior to accepting his current position, Dr. West worked as an Industrial Recycling Specialist with UW-Extension’s Solid & Hazardous Waste Education Center (SHWEC), where he provided technical assistance to hundreds of Wisconsin businesses and industry. Dr. West also spent eight years in private industry with a manufacturer that was using paper mill sludge as feedstock. His duties included directing the company’s successful ISO 9002 registration effort and developing their Environmental Management System in compliance with ISO 14001. Dr. West has teaching experience at every level from sixth grade to college undergraduate. His research focuses on industrial ecology and the environmental health of urban waters. Non-academic interests include bicycling, cross-country skiing and classic sports cars. Jacob manages Southeastern Wisconsin Watersheds Trust, Inc.’s (Sweet Water) stormwater program, Respect Our Waters, which includes several initiatives to inform and educate community members about stormwater pollution prevention. He holds a B.S. from the University of Wisconsin-Whitewater in Integrated Science/Business, with an emphasis on water. He is extremely grateful to have the opportunity to combine his career and a passion for the outdoors.